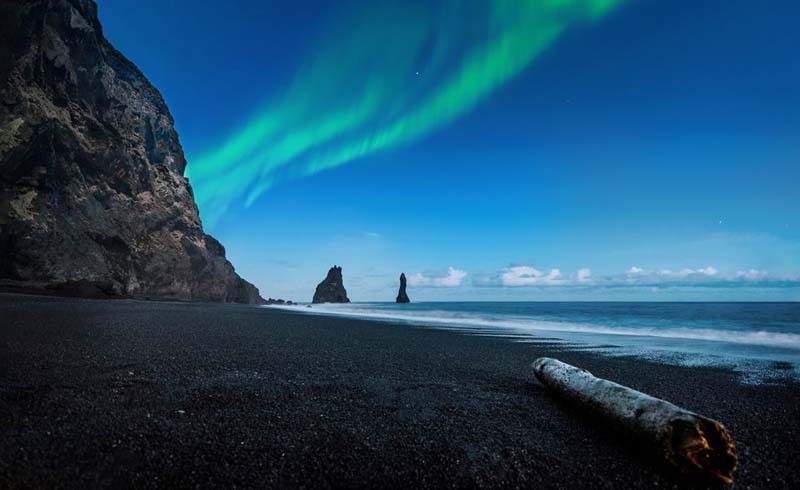 If you’ve heard of Iceland’s famous black sand beaches, you’ve heard of Reynisfjara. Located on the southern coast, Reynisfjara can be found right before you hit Vik, if you’re driving from Reykjavik. 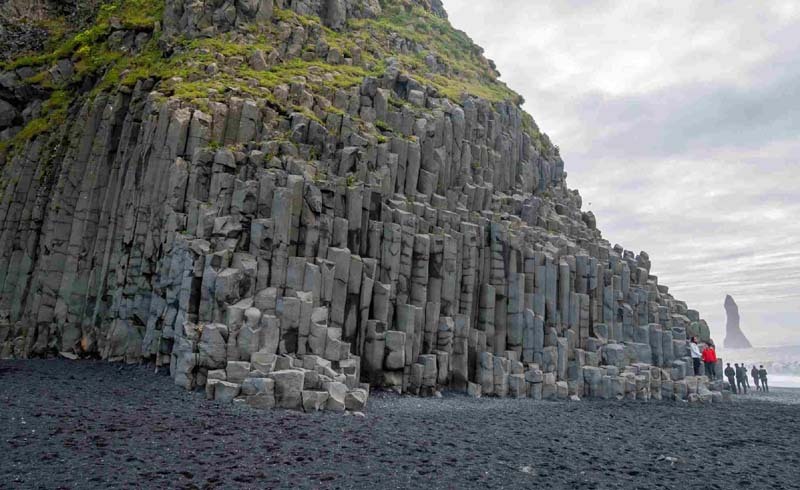 This stunning region is known for its interesting geology: the black sand beaches (of course), basalt columns, and a series of rock formations important to local folklore. Legend has it, the basalt columns — which collectively are called Reynisdrangar — are actually two Icelandic trolls who once attempted to drag a ship from the sea onto land. They couldn’t get the ship in before the daylight broke, turning them both into stone. Whether you believe the stories or not, it’s yet another completely unique natural formation we can attribute to Iceland. Getting there is easy enough, but there’s a lot to know when visiting Iceland’s Reynisfjara. From wave safety to the many hikes hiding in the area (they’re well worth the time spent researching them), read up before you plan your trip. Like most natural attractions in Iceland, Reynisfjara is hard to miss. There are plenty of signs directing you to the black sand beaches from Route 1. You’ll take the turn marked Route 215 and it’s a 10-minute drive off of the main road. If you’re visiting from Reykjavik, you will hit Reynisfjara before you enter the fishing village of Vik. 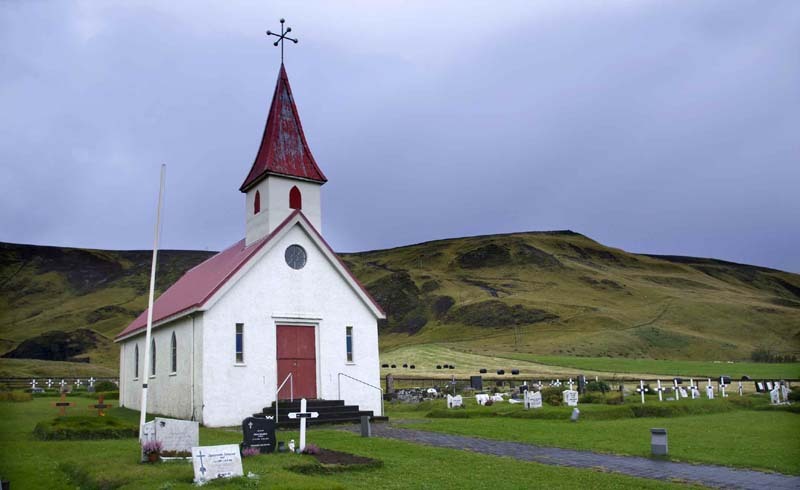 Its location makes it the perfect stopping point on a southern road trip from Reykjavik to Jökulsárlón, since it’s placed directly in between the east and west coasts, two-and-a-half hours from each spot. There’s a small café called Black Beach Restaurant that serves a limited menu and drinks. There’s also a public bathroom onsite. The parking is free, if you can find a spot (the lot often fills up during the day). Like everywhere else in Iceland, the weather is unexpected! Dress in layers, and don’t forget your windbreaker. It can get extremely windy and you’ll be thankful for the reprieve. Skip the sandals and swimsuits; this is far from a tropical beach. Hiking boots fare best against the rocky beach. The angry waves are enticing and while some may want to venture to see them up close and personal, keep your distance. Reynisfjara is known for its dangerous, and often life-taking, sneaker waves (or, waves that are much stronger and larger than the waves before them). 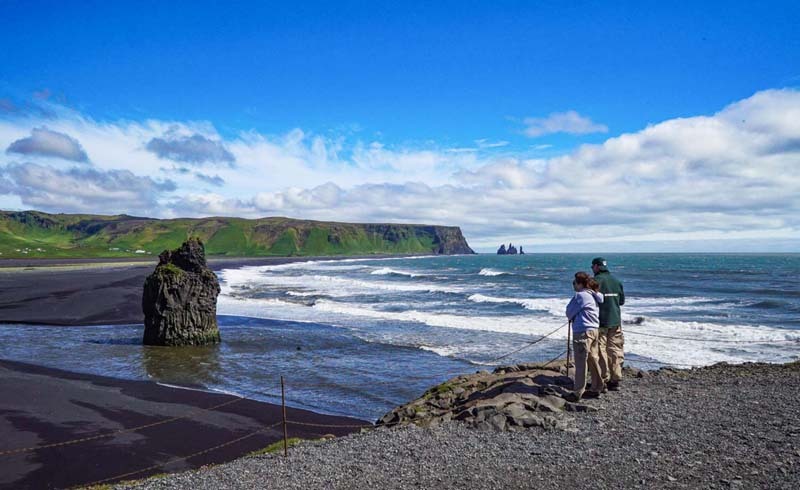 The warning signs at the end of the Reynisfjara parking lot will tell you everything you need to know, but remember to keep your distance and note the incoming tides and you’ll be all set. If you want to see the basalt columns — and you definitely should! — plan your visit with the tides. When the water is coming in, walking along the columns becomes very dangerous as the waves will often smash up against the rocks in unexpected intervals. Surf-Forecast provides an excellent look at the tides in real time. Try and visit when the tides are at their lowest; there are a number of shallow caverns — the biggest is called Halsanefshiller — that are also beautiful to see in person, given the right timing. In Iceland, you can bet that any natural attraction will bring around a crowd during the sunset. Reynisfjara is no exception. There is a nearby parking lot, which has made it easier to locate and enjoy the beach for both locals and travelers. Reynisfjara is also a hot spot for bus tours, and you’ll often see buses lining the road up to the parking lot. A local guide who once captured a traffic jam leading up to the beach shared with Iceland Magazine that the busiest times are between 2 p.m. and 5 p.m. In general, plan your visit late at night for fewer crowds and lower tides. If you’re looking for a birds-eye view of the black sand beach, you’ve got plenty of options. First, head to the church overlooking the city (it’s red — you can’t miss it). The entire field behind the church is full of hiking trails for all levels. There are trail markers to help show you the way. If you’re looking for something a bit more challenging, head uphill to the right where the trail first splits past the church. This will send you on the 4- to 5-hour hike to Mount Hatta, the highest peak near Vik at 500 meters. You can also hike around Mýrdalsjökull — a glacier in the highlands of the south — but make sure and bring the necessary attire (crampons, warm clothing) before taking these adventures on.